Okay fine. I gave into the pumpkin. I love pumpkin – I really do. I was just getting tired of feeling like it got all the excitement and spotlight in the fall. As soon as the first hint of fall and September hits people go pumpkin crazy. I thought maybe it was good to switch it up. 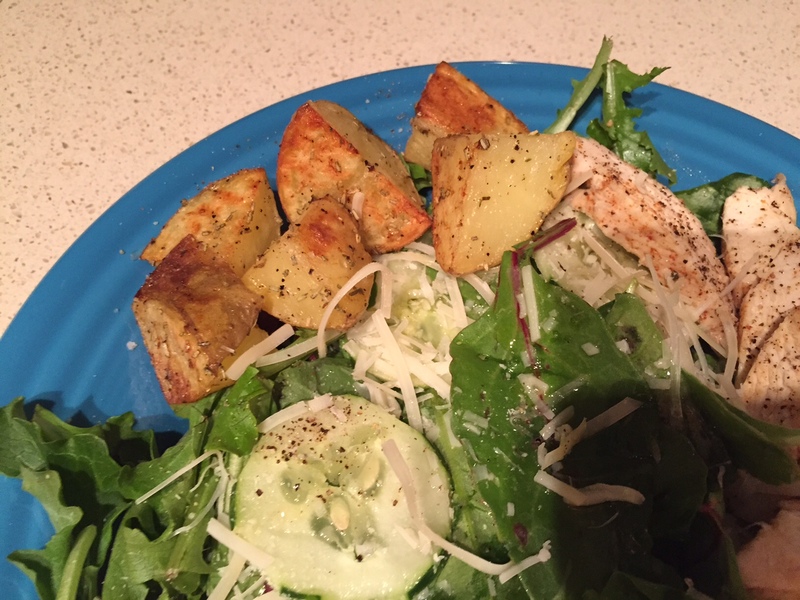 But you know how I love to use up leftovers, and I love to try new recipes. Well I had a cup of pumpkin puree sitting in the fridge begging to be used, and since I’d recently made cookies I figured I should go a different direction. Ice cream! 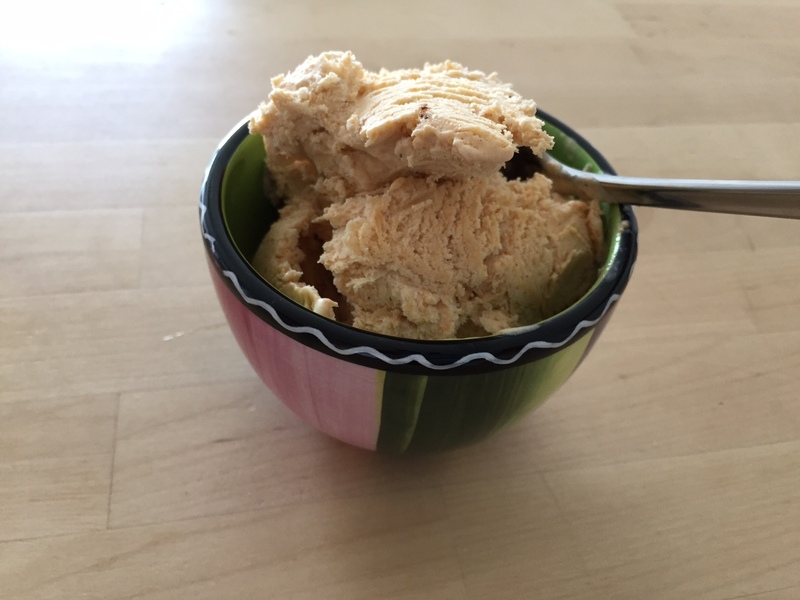 I had had this recipe tagged for a few months now probably – the two ingredient ice cream recipe that promised to be awesome and easy for those without an ice cream maker. I simply had to test it out. I love ice cream, but I try to keep it out of the house as it is just too tempting and easy to overeat. I mean, you can eat too many cookies, but the numbers guilt you out of it usually. It’s quantifiable. You know you ate 4 cookies, but with ice cream you can say, I just had a bowlful. (Does anyone actual measure their ice cream to meet the serving size?) And then ate a few spoonfuls while I was serving it. And my bowl was pretty darn big. <guilty smile> If I owned an ice cream maker, it would just be another one-trick kitchen gadget that I would use as an excuse to make homemade ice cream way too often. That just sounds dangerous. Well now that I’ve found this recipe, I might have just found a new level of kitchen danger because this recipe is way too easy and adaptable and delicious. And unless you want to drink half a can of sweetened condensed milk (okay, yeah you probably do) it’s hard to make a smaller batch. 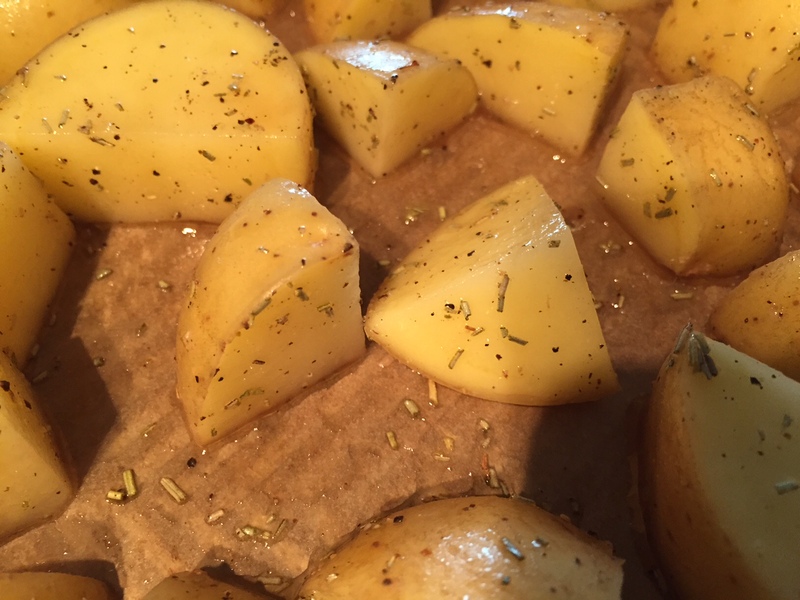 The great thing about this recipe – besides no machine needed – is its adaptability. You can put any flavor you want in it. 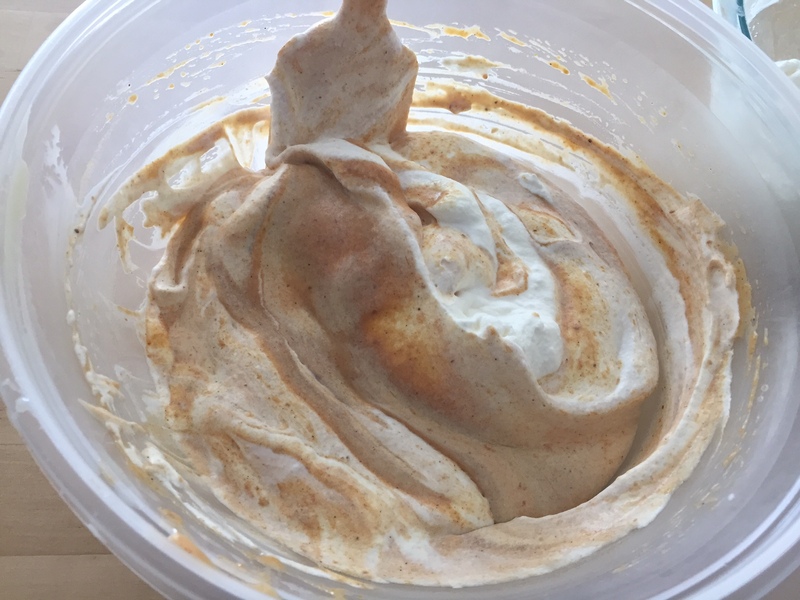 In fact I had full intentions of making multiple flavors of ice cream with this batch and then completely forgot when it came time to mix in the pumpkin. Oops! Anyway, enough of my rambling. You want to know how to make it? You whip some cream. You fold it into some sweetened condensed milk and you freeze it. And you wait. Then ta-da – ice cream! If you have time, chill a large mixing bowl and beaters in the freezer for 10 minutes. This helps the cream to stay cold and whip better (in theory). In another large bowl pour your sweetened condensed milk. Stir in remaining ingredients except the cream. Set aside. In your chilled bowl with your chilled beaters, whip your cream starting out at a low speed to avoid splatters. Gradually increase the speed as it thickens and beat until soft to medium peaks form. 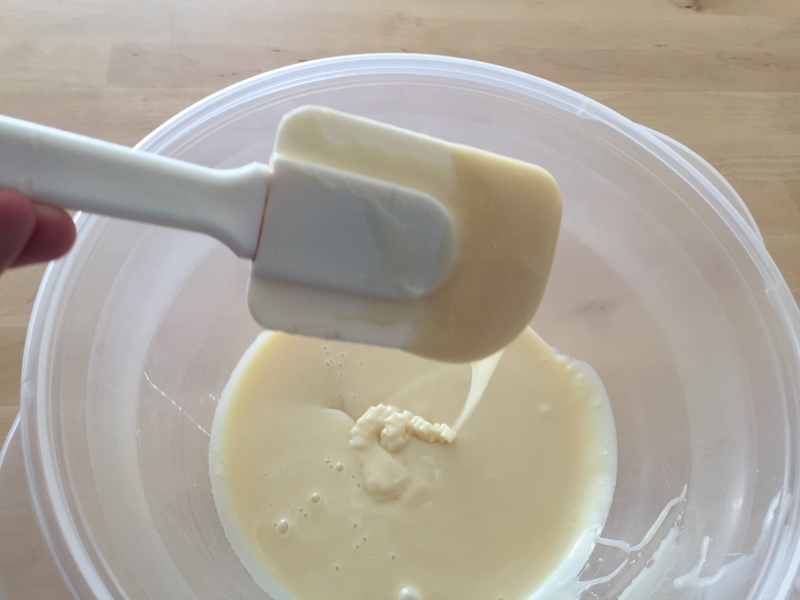 It will take some time, but if you’re using a hands-off mixer such as a Kitchenaid mixer, don’t walk away from it or you will end up with butter. 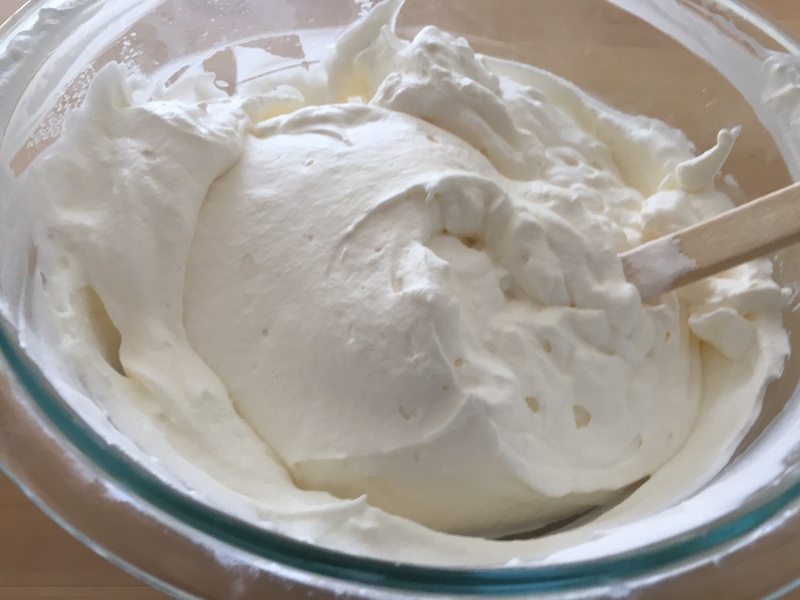 After it seems well-whipped, be sure to scrape the sides and bottom with a rubber spatula to make sure the cream at the bottom has been sufficiently whipped. Beat again if you find some cream that is looser. 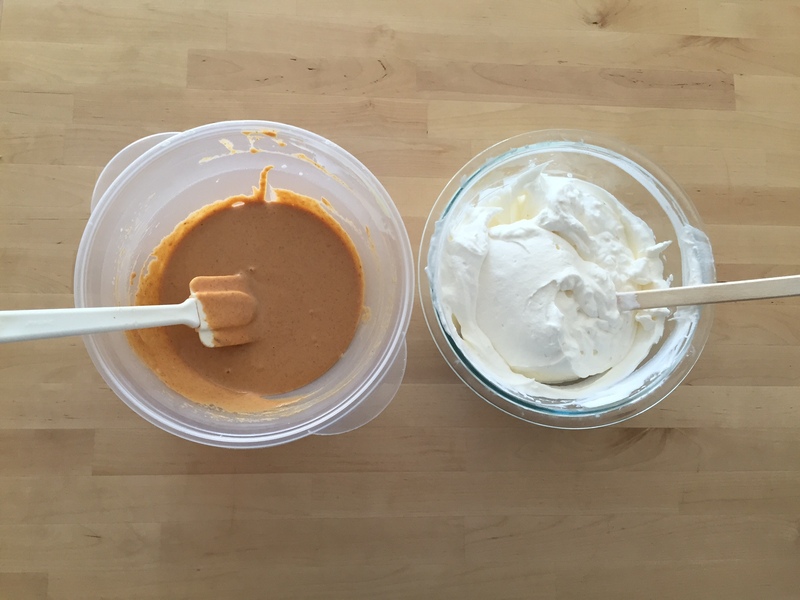 Gently fold the cream into the pumpkin and sweetened condensed milk mixture. Start with a quarter of the cream and gently fold it with a sweeping motion from the bottom of the bowl to the top and over. Gradually fold in the rest so that the color is uniform. The reason you fold gently as opposed to beating vigorously is so you don’t lose the air you just whipped into your cream. Put a lid on your bowl and freeze for at least 5 hours. You can stir it after a few hours to evenly chill it, but you don’t have to. I found mine took about 8 hours, but it will depend on the depth of the bowl you freeze it in and your freezer. 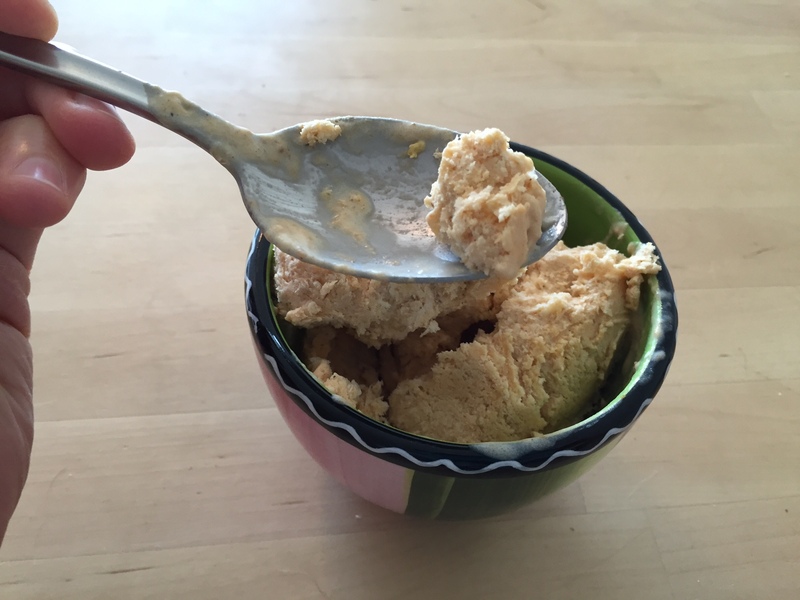 Scoop into a bowl (or eat straight from the container!) and enjoy! *You can substitute pumpkin pie spice for the spices I used. Just experiment with the amount. I would guess no more than one teaspoon. Note: I find this ice cream is best at its “freshest.” Because it is not churned like ice cream machine types it will get icier (instead of staying creamy) as it sits. If you invite your friends over for an ice cream party you can enjoy it at its prime. 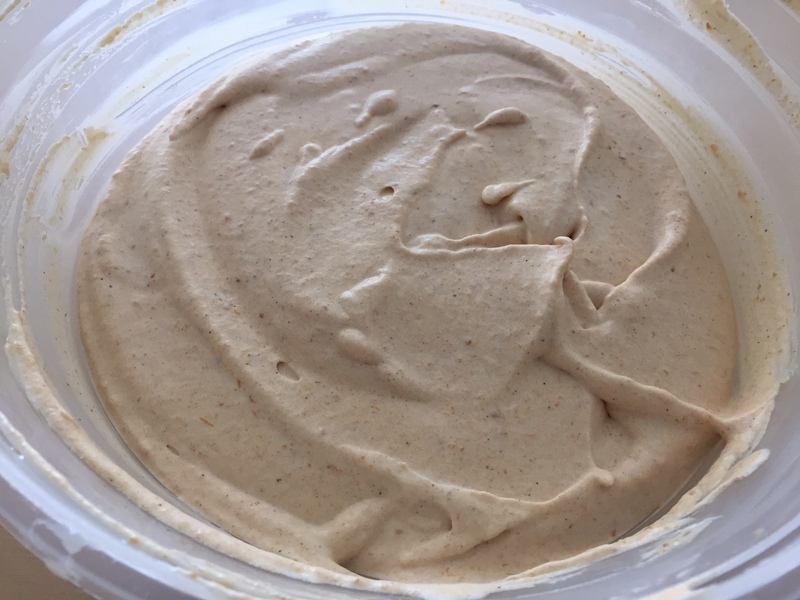 I also found it helps to let it sit out at room temperature for 15 minutes before scooping, but that will probably depend on the temperature of your freezer. Summer’s a coming. It is here! Or at least it feels like it. The weather has turned humid and muggy and sunny and green and the school children are getting restless (the teachers and staff too! Trust me – I work at a school.) 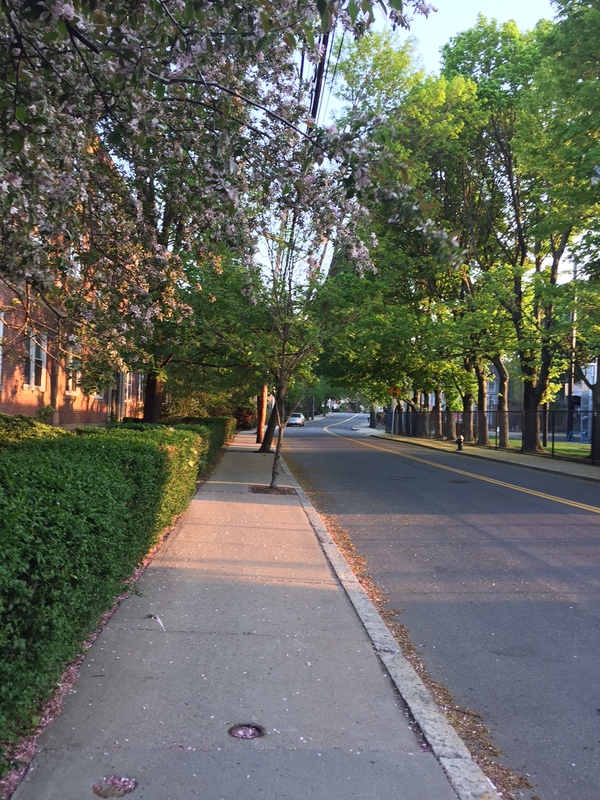 But it is beautiful this time of year where I live. I am loving the views! Now I love cooking and baking, but when it gets hot and you have no central air I can lose my energy for cooking, especially in a hot kitchen. 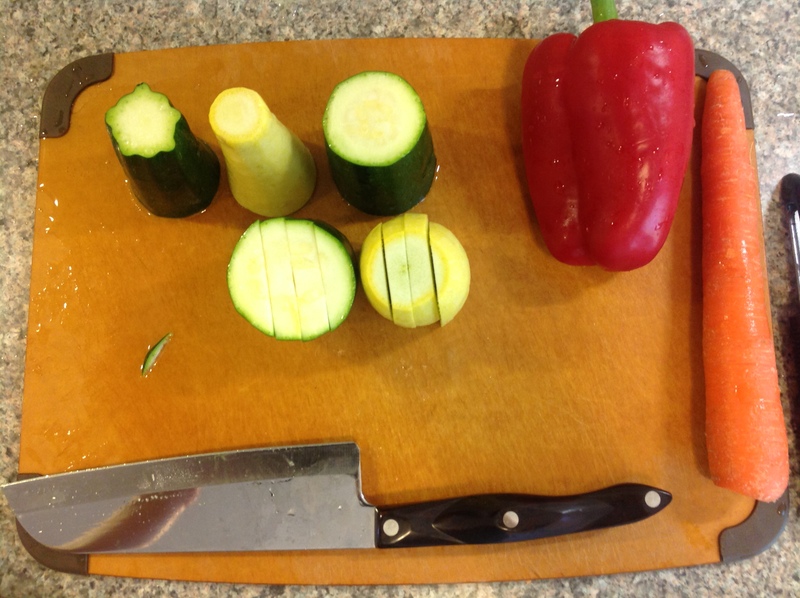 When I think of a good summer recipe, I think of something that is quick, fresh-tasting, and doesn’t require the oven. When you don’t have an outdoor grill, these recipes can be hard to come by. Sometimes I sacrifice one night of oven cooking for several nights of tasty leftovers, but other times it is just not worth it. 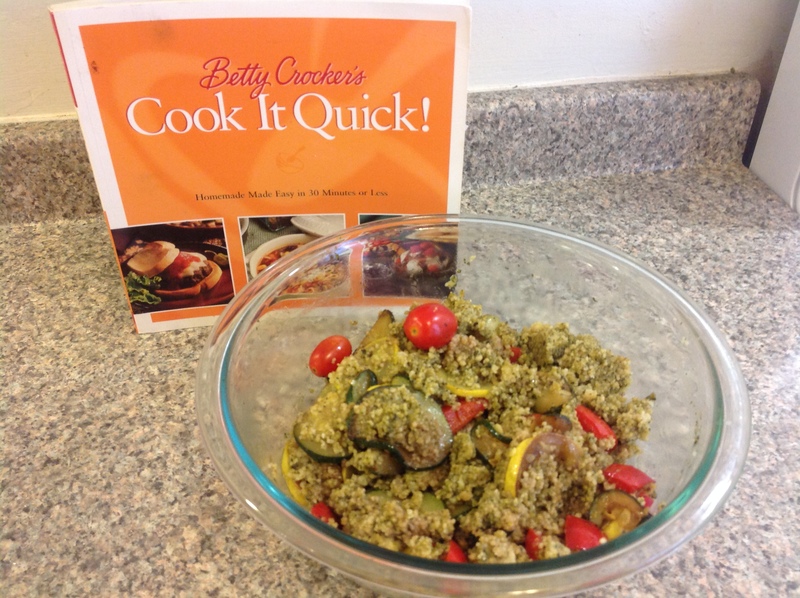 from Betty Crocker’s Cook it Quick! Cook couscous according to package – for 1 cup you will boil 1+1/4 cup water, remove from heat, add couscous, cover and let absorb the water (off heat!) for 5 minutes. Fluff with a fork immediately and set aside. 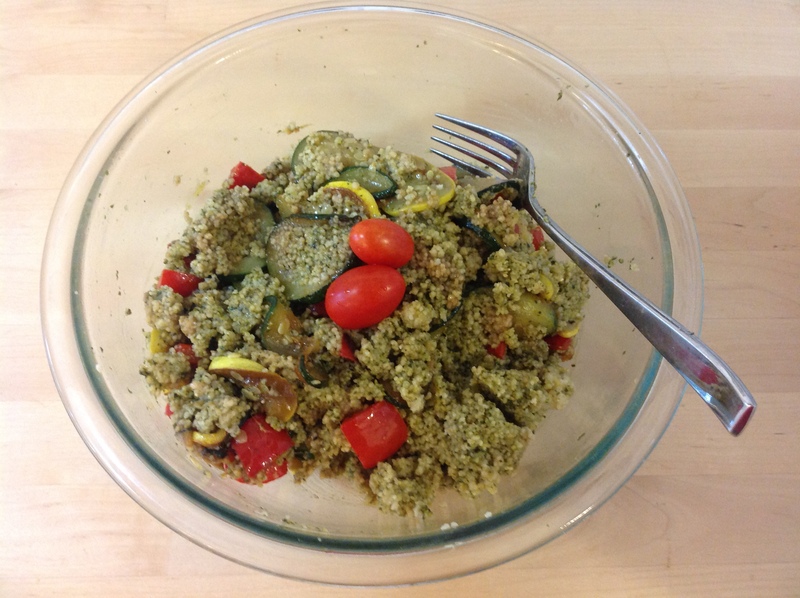 Toss couscous, vegetables, pesto, and vinegar in a large bowl. Serve warm or cool. ***Alternative method: Now I don’t know about you, but when I try and saute a large amount of vegetables in a 10 inch skillet for 5 minutes until “crisp-tender” I end up with somewhat softened vegetables and maybe a little browning. 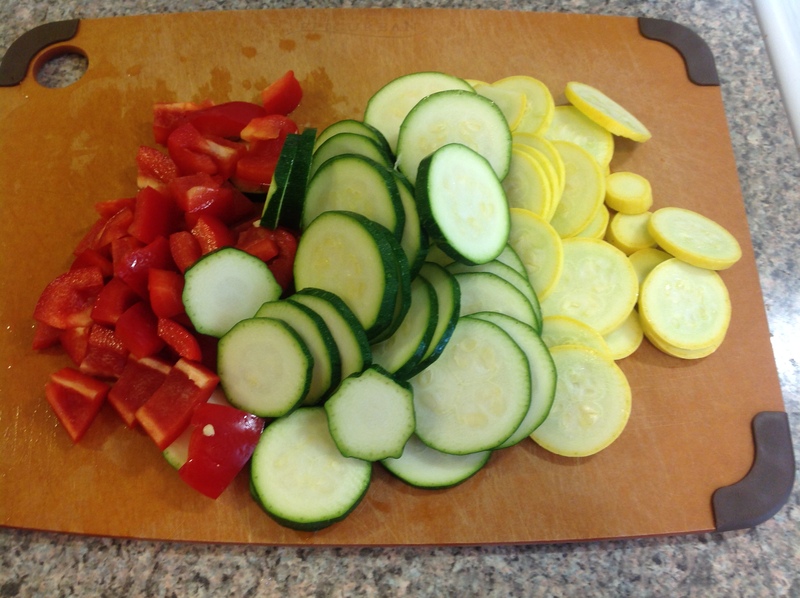 I found that this amount of time and vegetables in this size pan leaves no room for crisp or tenderness and even leaves some of the veggies raw from not enough heat exposure. 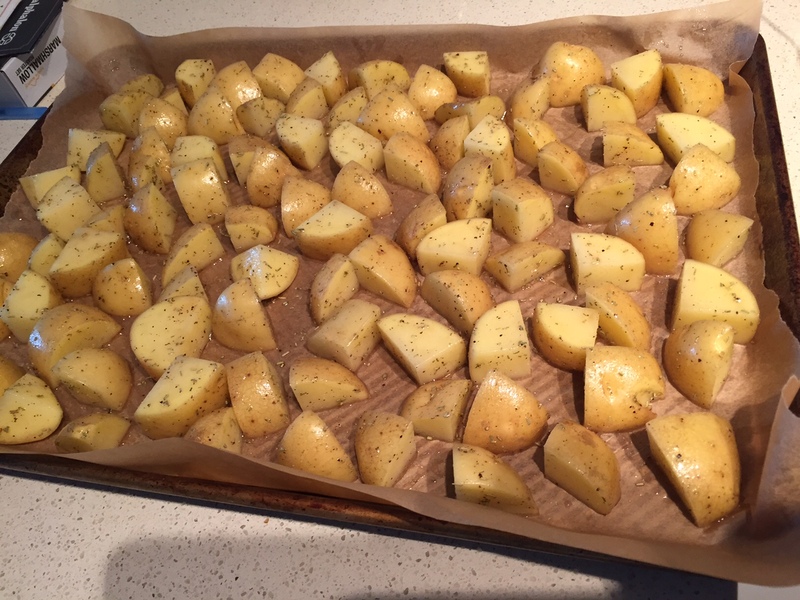 If you don’t mind running the oven I recommend roasting the veggies, well spread out on a sheet pan or two. It does not require as much stirring, and you can walk away from the hot oven for at least a little bit of time while they cook. 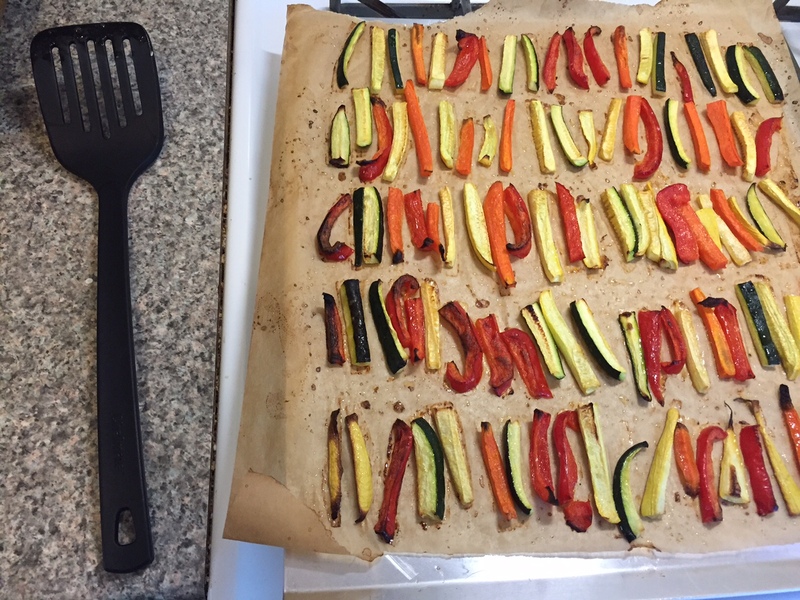 Cut the veggies into sticks, cubes, or slices (so long as they are all even-ish in size), toss with oil, salt, and pepper and spread out on parchment lined sheet pan. 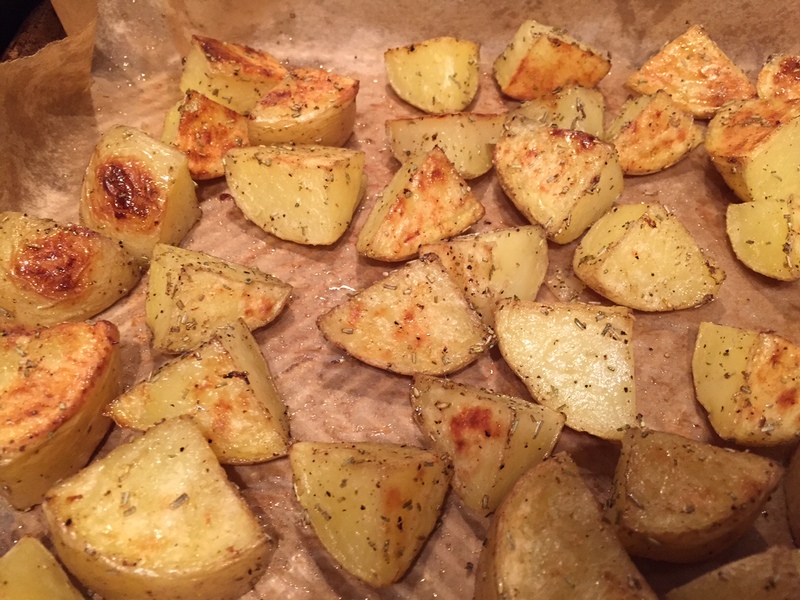 Roast at 425 degrees, stirring once toward the end until they are lightly browned and beginning to caramelize. Mmm tasting looking veggies. 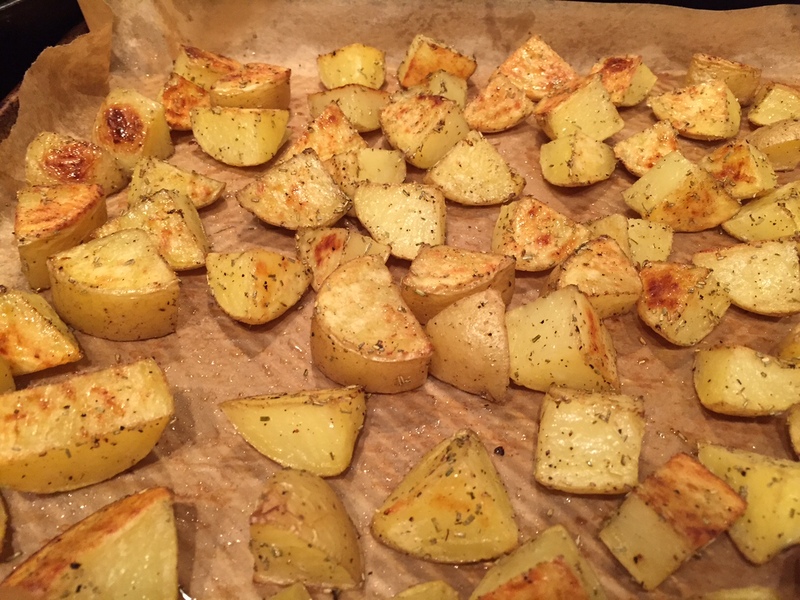 Throw these in with your couscous and pesto or serve on the side of your main dish as veggie “fries.” They are addictive and delicious. Happy almost summer!